Rinse short ribs and pat dry. Generously salt and pepper them. With a knife, score the back side along the bone (this allows the meat to absorb more of the cooking liquid). In a large stockpot, heat 2 tbsp olive oil over medium high heat. Add shortribs and brown on all sides, about 4 minutes on each side. While the meat is browning, place dried mushrooms in a small bowl and cover with 3 cups of hot water. Allow to soak for 20 minutes. Once the meat has finished browning, remove and set aside. Add the white mushrooms to the stockpot and brown over medium high heat. Add carrots, celery and onion, Cook until onions are translucent. Add garlic and cook until fragrant, then reduce the heat to medium. By now the dried mushrooms will have softened. Drain the mushroom soaking water by straining it through a coffee filter or multiple layers of cheesecloth Chop the mushrooms into small pieces and add them to the stock pot. Add the chicken, beef or mushroom stock, barley and seared short ribs to the stockpot. Stir to combine all ingredients. Reduce heat to a low simmer. 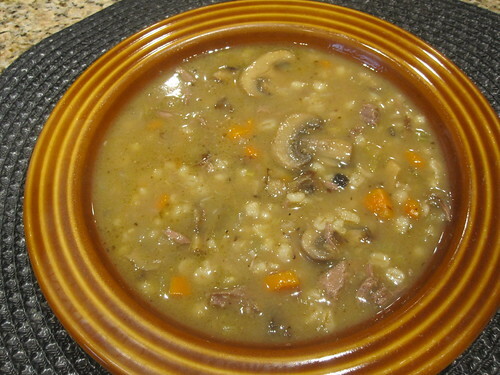 Allow soup to cook, uncovered, for 2 hours or until the barley and short ribs are completely tender and the soup is nicely thickened. Add about 2 cups water during the simmer if the soup becomes overly thick. After cooking, season with salt and pepper to taste. I use about 1 1/2 tsp salt and a heaping 1/4 tsp pepper. Use whatever amount of seasoning tastes best for you. Remove all of the short ribs from the soup and shred, then mix the meat back into the soup before serving.